there was a small village in the Nasu area. One day to a house in that small village came a young man. This young man was on his way to Mt. Nasu to train as a Yamabushi (mountain priest). the family eventually agreed and the young daughter of the house was told to look after him. and his training to be a Yamabushi. worrying about him realizing that she loved him. and went up the mountain to look for the young man. She disguised herself because, the mountain being a holy place, women were forbidden. and to help cure diseases. 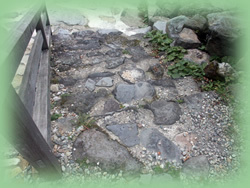 Women were also forbidden to go there; the Yamabushi rules were very strict. and then suddenly she saw a Yamabushi. It wasn't the young man but another, who realized that she was a woman. He pulled out his sword and cut off her head! when he saw it he was grief struck. He built a shrine over the spot where she was killed. and kept there to be prayed over and purified. 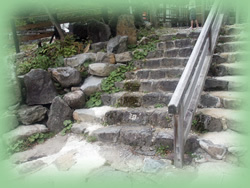 They had been given this area as a reward for their services to Hideoshi. some 400 years!! A very unusual occurrence in Japan. The old shrine stopped being used and the sword disappeared. The Ozeki family (Kurobane-han) built a house on the site that later became Himenoyu. the owner being Kumagai Genzo. 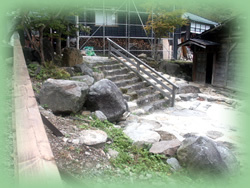 Whilst preparing the site to build a new onsen ryokan, the missing sword was found. he thought that it would bring bad luck. where it had been found and ordered the room to be kept closed and sealed. Believing that as long as the room was kept sealed the ryokan would prosper. In Meiji 40 (1907) the sealed room's walls were broken by a large rockfall. The owner immediately ordered the walls to be repaired. at Kita onsen,the floodwater carrying away the sealed room and the sword. but with many difficulties and problems. she wanted the shrine to be rebuilt and prayers offered. he also called for a Shaman. A memorial service was also held for her. became well again and the ryokan became prosperous. and legends of Kita onsen.